Secretary-General Ban Ki-moon (right) and UN and Arab League’s Joint Special Envoy for Syria Kofi Annan, in Geneva. The first group of six United Nations unarmed monitors tasked by the Security Council to report on the implementation of a full cessation of armed violence in Syria has arrived in the capital, Damascus, and began their work, according to a spokesperson for the world body. “The monitors’ early tasks include liaising with Syrian Government authorities and security forces as well as the opposition to ensure that all sides understand the role and work of the team,” UN deputy spokesperson Eduardo del Buey told reporters in New York. The Council on Saturday authorized the deployment of an advance team of 30 unarmed military observers to liaise with the parties and to begin to report on the implementation of a full cessation of armed violence, pending the deployment of a UN supervision mission that will be tasked with monitoring the ceasefire. The rest of the 30-member advance team will arrive in the coming days, noted Mr. del Buey, who acknowledged the “critical” support of the Italian Government, which is airlifting UN vehicles from the Organization’s logistics base in Brindisi and other locations so that the monitors are able to be mobile quickly and travel to all locations in Syria. The violence in Syria, which began in March 2011 as a protest movement similar to those witnessed across the Middle East and North Africa, has claimed over 9,000 lives, mostly civilians, and displaced tens of thousands of people. Secretary-General Ban Ki-moon, who is currently on an official visit to Europe, today welcomed the arrival of the advance group of monitors and said that he will present his proposals for an enlarged official observer mission by 18 April. The situation in Syria is very fluid, he said, adding that he is very concerned about the renewed shelling of the city of Homs that has taken place over the last two days. He once again urged the Syrian Government, in the strongest terms, to end the violence. At the same time, Mr. Ban said he expects that as a next step the political dialogue will continue. A political solution needs to be found which respects and reflects the aspirations of the Syrian people. This solution should be Syrian-led. The Secretary-General has repeatedly called on the Syrian Government to abide by its commitment under the six-point plan drawn up by the Joint Special Envoy of the UN and the League of Arab States, Kofi Annan, who is leading a diplomatic effort to bring an end to the bloodshed. Mr. Annan’s six-point proposal calls for an end to violence, access for humanitarian agencies to provide relief to those in need, the release of detainees, and the start of inclusive political dialogue that takes into account the aspirations of the Syrian people. Also today, the UN-mandated Independent International Commission of Inquiry on Syria welcomed the arrival of the advance team of monitors, while voicing its hope that the ceasefire will hold and that the cessation of violence will contribute to an atmosphere conducive to peace and national dialogue. “The Commission also hopes that the ceasefire will contribute to putting an end to the gross human rights violations that it has been reporting on over the past six months,” stated a news release issued by the three-member body. The Commission, which presented its report to the UN Human Rights Council last month, documented patterns of summary execution, arbitrary arrest, enforced disappearance, torture, including sexual violence, as well as violations of children’s rights by Syrian security forces. Gravely concerned that crimes against humanity had been committed, it called on the Government to put an immediate end to the violations and bring the perpetrators to justice. The Commission added today that it remained concerned with the deteriorating humanitarian situation, especially in areas where military hostilities have been more intense. The UN is scheduled to convene a Syrian Humanitarian Forum on Friday in Geneva to mobilize the necessary resources to provide humanitarian assistance to the hundreds of thousands of people uprooted by the crisis. 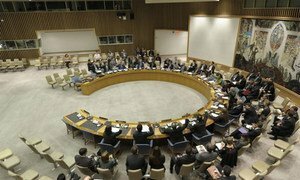 The Security Council today authorized the sending of an advance team of up to 30 unarmed military observers to Syria to report on the implementation of a full cessation of armed violence, pending the deployment of a United Nations supervision mission that will be tasked with monitoring the ceasefire.